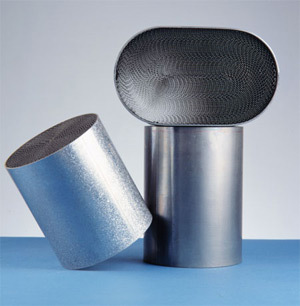 The substrate of a catalytic converter fulfils a vital role in supporting the catalytic material, and at the same time must be capable of withstanding some extremely arduous conditions. Operating temperatures may be in excess of 900 ℃ and the substrate will also be exposed to fast moving, corrosive exhaust gases, rapid changes in temperature and pressure and external factors such as shocks and vibration. Another important attribute of the substrate, apart from durability, is that it must not cause an excessive pressure drop in the exhaust system. metal versions made from ultra-thin foil. As the metal foil is typically only 0.05mm thick, compared with a typical wall thickness of 0.16mm in a ceramic substrate, the pressure drop in the exhaust system is reduced. 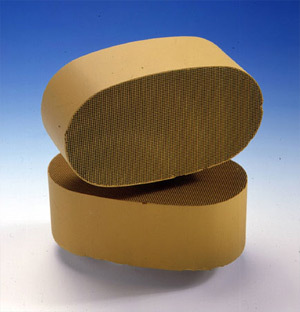 Metal has a lower specific heat capacity than ceramic materials, which allows catalytic converters based on metal substrates to reach their required operating temperature more quickly after a cold start. The thermal conductivity of metal is greater than that of ceramics and this fact assists in maintaining an even temperature throughout the substrate and preventing hot-spots which can cause irreversible damage. A good quality metal substrate incorporates an outer band of stainless steel which is brazed to the core of the substrate and is intended to be welded into the exhaust system. By contrast, ceramic substrates (and some cheaper metal substrates) are retained in a metal casing using an expandable fibre mat. This ‘canning’ stage introduces a potential durability problem which does not apply with a good quality metal substrate.